Kangaroo (KA): Moves along Queen-lines over 2 hurdles of either color (which may or may not stand on adjacent squares) to the square immediately beyond the second hurdle. A capture may be made on arrival, but the hurdles are not affected. Some comments explaining the connection between this problem and the No.291. Everything started with some analysis of tactical effects in No. 291 and the check of use of fairy pieces. W1: creation of hurdle for white grasshopper, preparing for future mating move, creation of hurdle for black lion (in a). No fairy abilities of neutral chamaeleons are used. 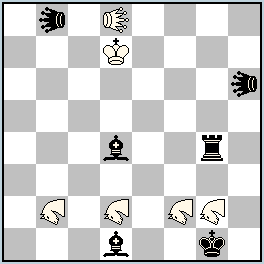 B2: removal of white obstacle, preparation to next move. W2: jump over hurdle, arrival of rear piece for future battery. W3: double check and mate. Return of neutral piece is impossible due to chameleon transformation. But really we have two fairy effects which cancel each other – neutrality is used to justify chamaeleon transformation and chamaeleon transformation is needed to prevent effect of neutrality. White queen may be used instead of neutral chameleon without any loss of contents. Another thing which also also seemed unjustified is the use of of two different fairy pieces in twins. So, by changing neutral chamaeleon to white queen and some scheme change the following position was reached. Still it does not look much better than original, because, first, the solutions look too similar and, second, there is a disharmony – white queen creates a hurdle for black lion only in one solution. It looks impossible to avoid creating a hurdle at all. But at the same time it may be seen that white queen may move to b3 where may also create a hurdle for black lion and also have the same thematic play on diagonal d1-a4 as on d file. The easy way to switch to possible ODT is to use twins, because it allows to keep in check white force. White queen is a very strong piece for helpmate, so quite a lot of technical material will also be required, see the following position. Another possibility was used in No. 298, with addition of a hurdle for a queen (converting it to much less powerful Leo) and corresponding transformation of Grasshoppers to Kangaroos. It was just the strike of luck that no technical pieces were needed in this case and it was possible to replace a half-used pawns with fully used kangaroos (while this type or fairy piece were already required by scheme).